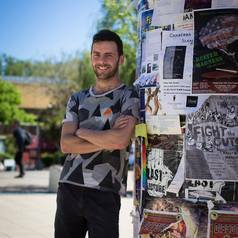 Student in the Master of Climate Change program at the ANU, focusing on policy and politics, and conducting research into the political economy of unburnable carbon. BA (Hons) in Philosophy at ANU. Spokesperson for the Fossil Free ANU campaign. We are calling on the ANU to show climate leadership by divesting from coal, oil and gas. Research assistant at The Australia Institute on a project looking at opportunities and obstacles for fossil fuel divestment in Australia.